President Akufo-Addo Tuesday named Nalerigu as the capital of the newly created North East Region of Ghana. The President made the announcement during ceremonies to present the Constitutional Instrument, CI 116 which gave effect to the creation of Ghana’s eleventh region, to the chiefs and people of the new region at the Golden Jubilee House, Accra. Nalerigu, the largest town in the East Mamprusi Municipality also serves as the traditional capital of the Mamprusi people and the seat of the paramount chief, the Nayiri. The President also charged the minister of the Northern region, Salifu Saeed to be the caretaker of the region until a substantive minister is appointed. President Akufo-Addo announced the allocation of GH¢20m for each newly created region towards the development. Pledging his commitment to ensure that the development of the newly created region is met, President Akufo-Addo called for a unified front to ensure that the region becomes one of the best in the country. “I want to assure the region however, that government projects and structures will be equitably shared across the region. Let us work hard together and I am very sure that with dedication and commitment, the North East Region will develop and catch the light of every resident and help us to build the great nation of Ghana we all desire. "Government will make sure the desire for growth and progress which is the underlining reason for the voting for the creation of the North East Region is met”. The President also lauded all those who worked to ensured successful creation of the region. 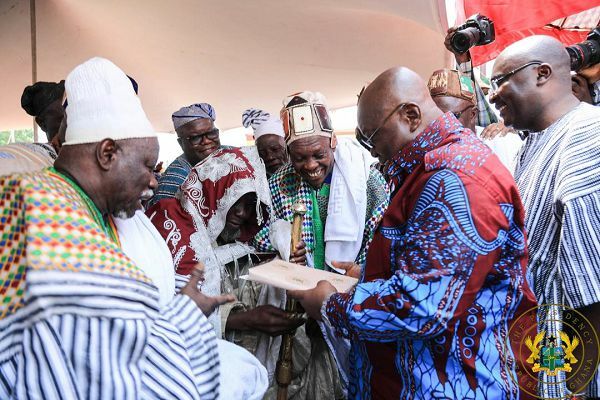 The Nayiri (overlord) of Mamprugu land, Naa Bohigu Abdulai Mahami Sheriga, received the CI from President Akufo-Addo.